Admittedly, reason is not something that comes naturally. We have to work at it, and it requires a commitment. And while we atheists tend to be fairly good at arguing that reason is preferable to religious faith, we often have difficulty remembering this when it comes to our favorite social and political ideologies. Tribalism is far easier, and we seem to prefer it even though it is often counterproductive. 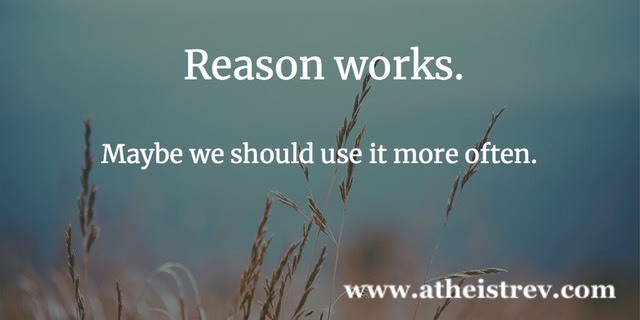 We know that reason works, and we can all think of countless examples where our world has been improved through the application of reason. We are fond of claiming that we would like to see more reason injected into our political system. We tend to think that important decisions (e.g., the laws that impact us all) ought to be made on the basis of reason and facts instead of tradition, faith, or outrage. Thus, it is not just that we appreciate what reason has done for us in the past; we are hoping that more of it will improve our present and future. In this context, I think it is important for every one of us to make an effort to use reason more often and more consistently in our own lives. By being explicit about this and taking advantages of opportunities to model it, we can make sure that reason does not become a lost art. We all have many opportunities in our day-to-day lives to promote reason during our interactions with others. It matters little whether these interactions take place offline or online. If we truly believe that reason works, we should do what we can to promote its application. Learn critical thinking skills and practice reason. Strive to be more reasonable in our interactions with others regardless of whether they do the same. Learn to recognize the signs that we are being unreasonable so we can correct our behavior. Let the reasonable people you encounter know that you have noticed and appreciate their efforts. Make it clear to those tasked with governing that you expect them to base decisions on reason instead of the many less desirable alternatives. So, what will you do to spread reason today?